There is nothing more traditional than featuring antique cast iron fireplaces in any living room. Fully restored and devoid of any traces of rust, cast iron fireplaces are a most effective fixture in your home. With a suitable fire surround and a mantelpiece, they add an atmospheric touch to your lounge. In the master bedroom, a touch of class as an ornamental feature. Before gas fires and central heating rose in popularity, cast iron fireplaces were a common feature in most homes. In the 1960s, we thought it was a good idea to cover the fireplace and its surrounds. Then replace them with gas fires, electric fires, or central heating. Some people thought it was a good idea to demolish the chimney breast. In recent times, traditional fireplaces have made a comeback, paradoxically, when the British coal industry went into decline and terminal demise. Interior design trends, particularly those from the 1980s onward, have favoured more traditional styles. Nostalgia could also be another factor and these trends have been favourable for our business. We at The Antique Fireplace Restoration Company have a wide range of styles, spanning the last two hundred years. These range from imposing Georgian fireplaces to early 20th century examples. All of which have added more features to the feature wall and made for a timeless look. 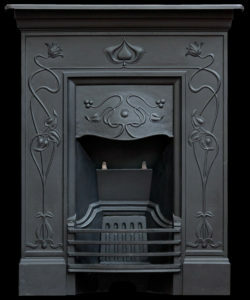 Most importantly, we have the cast iron fireplace surrounds to match, and all the required accessories. If you have any more queries about our cast iron fireplaces, or wish to arrange a weekday appointment, call us on 0161 225 8967. You could also send us an email to info@tafrc.co.uk. Alternatively, please call into our showrooms at The Antiques Village if you have a spare weekend. We are open from 10am to 5pm on Saturdays and 11am to 4pm on Sundays.